The holidays are a time to give thanks for what we love, and it just so happens as Cabo wedding planners we are feeling extra thankful for Cabo weddings like this one! Rebecca was one of the most thoughtful, generous brides we have ever worked with. She asked us to provide so many amazing details and amenities for her destination wedding guests we are sure they will be talking about her Cabo wedding for the rest of their lives. We met this bride more than a year ago, when she hired our team of Cabo wedding planners and specialists to help make her bridal dreams come true! What a wonderful journey it was to work with a bride who wanted to perfect even the smallest of details for every aspect of planning her Cabo wedding. Rebecca truly had a vision of the fairy tale wedding experience in Mexico, and our Cabo wedding planner team was there to help her refine and execute those ideas every step of the way. 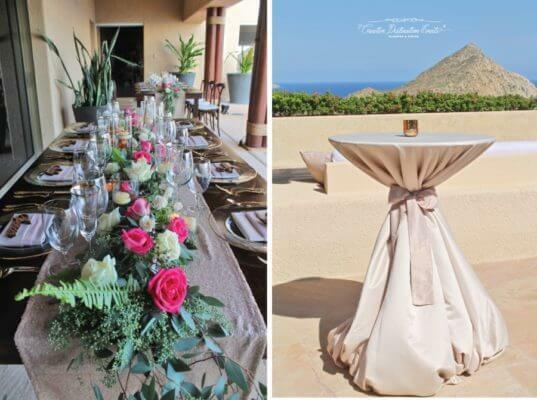 This Cabo wedding just goes to show that if you can dream it, Creative Destination Events can do it! Wouldn’t it be nice if your guests could stay in some of the finest luxury private villas while they attend your wedding festivities in Cabo? When you hire our Cabo wedding planning team, you have our promise they will find the best accommodations for everyone. Not only do we work with the top vacation rental property companies, but we also offer to arrange for door-to-door transportation to and from the airport. Need a place for your guests to gather as they all arrive in town? Our team of planners organized a meet-and-greet for Rebecca’s wedding guests, and we would love to do the same for yours! Do you think a spa day is in order after all that traveling? We think spa services are a great idea, and we planned a relaxing spa party for Rebecca’s guests with mobile spa services from Suzanne Morel Face and Body Care. We also put together so many adorable details for Rebecca just to make sure every one of her guests felt special. From custom invitations for each of the festivities to gift baskets with personalized “Do Not Disturb” door hangers, we left no stone unturned when it came to planning this heartfelt wedding experience. How do you feel about hosting an informal—yet perfectly put together—rehearsal dinner? 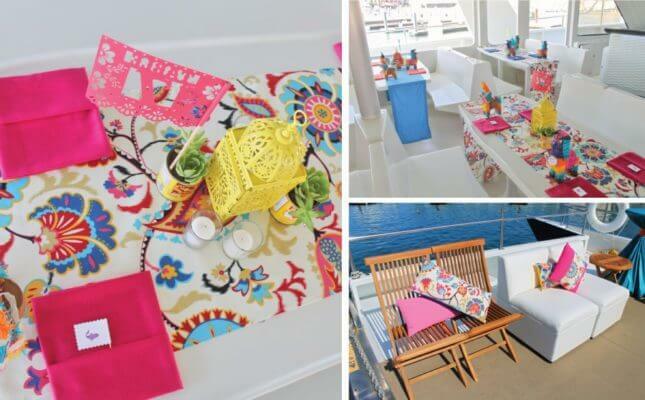 We assisted Rebecca with booking a dinner cruise on a yacht with a fun, vibrant Mexican theme. We made sure each and every detail was flawless, and our Cabo wedding planners personally oversaw the design of so many custom décor items to make certain the yacht was dressed up for the fiesta! 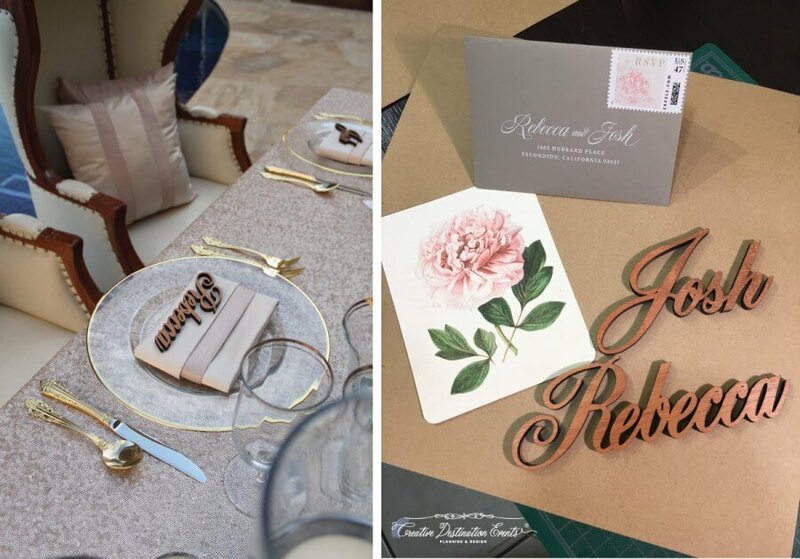 The team of designers at Cabo Linens, Things and More… really outdid themselves with all the fun details—it was the perfect way to spend the evening before Rebecca’s wedding in Cabo. And as much as everyone adored the Mexican rehearsal dinner, they were left speechless at the show-stopping luxurious villa wedding and reception! Where do we even begin with how stylish and romantic this private villa set-up was? Like all of our Cabo brides, Rebecca deserved the best of the best on her wedding day, and we are proud to say our Cabo wedding planner team delivered a dream-come-true! Everything about the wedding day embodied luxury, grace and sophistication. The décor, florals, venue, and food were all planned so carefully to work as one breathtaking scene. And of course, with that stunning panoramic ocean view as the background, Rebecca’s wedding was simply a vision of perfection. 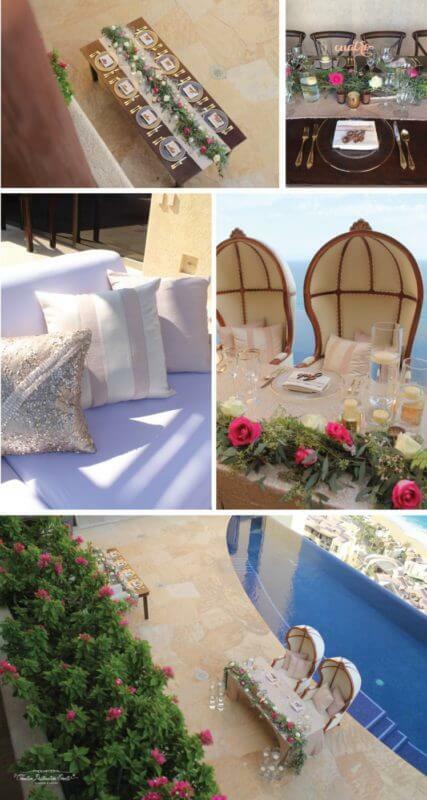 Again, we are just so thankful to work for our couples who decide to get married in the paradise that is Los Cabos. We have to give a tremendous amount of credit to our trusted vendor teams who follow our lead in going above and beyond for our brides and their guests. Remember, if you can dream it, we can make it happen in Cabo! Contact our experienced team of Cabo wedding planners to get started planning your own destination wedding today! This entry was posted in BEACH WEDDING, CABO WEDDINGS, WEDDINGS VENUES and tagged Cabo Wedding.